While I waited for the new arch to be revealed for the week, I wondered what the theme might be and had hoped for something related to Paris – Paris in the Springtime, Edith Piaf, the lurking Eiffel…so you can imagine my delight to see your lovely arch posted. Wow wonderful Arch Theme. Here is mine. Thanks for looking. Thanks Keron for being hostess. Good evening. Here’s mine. Thank you for looking. Here is my arch for this weeks challenge. Ahhhh – April in Paris!!!! Love the Paris theme. Thank you for this week’s challenge! 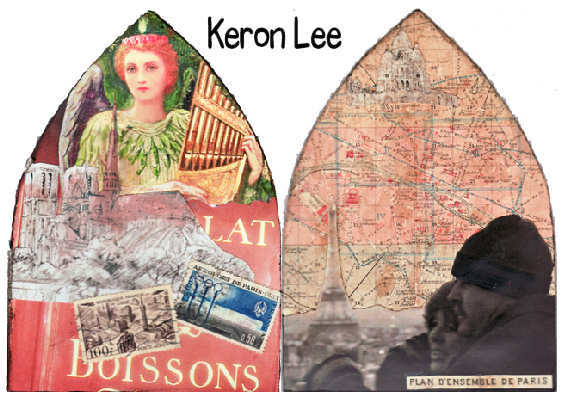 Love your arch and the sweet memory behind it, Keron! Beautiful. One of my favorite themes. thanks for that wonderfull theme !!! Here is my Collage de Paris or should it be du Paris? What a beautiful theme – I love Paris!! Here is my submission this week … I love Paris … hopefully someday I’ll get to visit. Wishing everyone a terrific week! I posted mine today at http://www.art-interrupted.blogspot.com. Lovely theme but it took me a while! My arch this week is part of a larger piece…thank you for looking!